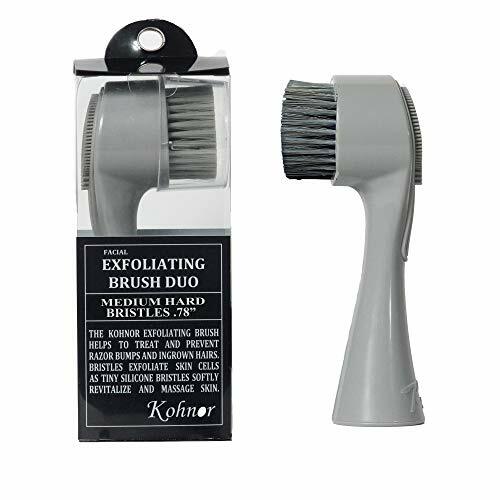 Our Exfoliating Brush is designed for both genders for your faces, necks, armpits, legs, or bikini areas. And this brush massage the skin to release the ingrown hairs. In or out of the shower, you’ll enjoy a secure hold with it unique, ergonomic design. Made to be easy to grip, even with soapy, sudsy hands. Your brush can be disassembled to drain water, soap, or anything else that may have collected in the head. This means it will stay safe and hypoallergenic through months of use. It not only works as an ingrown hair and razor bumps treatment tool, but also works as a scalp or body massager. 1. Use warm water to soften your skin, hair, and open your pores. 2. Brush in circular motions or against hairs grain for 15-30 seconds. Adjust the pressure you apply based on the sensitivity of the target area. NOTE: if you have a sensitive skin – start with 5-10 motions per treated area, using only straight lines up in one direction – against the hair’s grain. Apply slight pressure (almost none), when exfoliating. 3. Use it daily, morning and night, to achieve the best results. 1. GENTLE BUT EFFECTIVE – POVAD bristle brush stops ingrown hairs and razor bumps (scientifically known as pseudofolliculitis barbae) in their tracks! Ingrown hairs occur when a hair curls over and re-enters the skin. 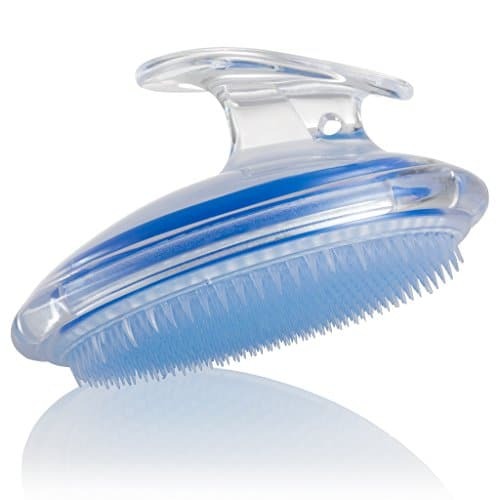 The springy polymer bristles of this brush massage the skin to release the tips of these hairs. 2. JUST A BRUSH AWAY, GET SMOOTH SKIN WHEREVER YOU REMOVE HAIR – POVAD chemical-free ingrown hair and razor bump treatment, it also makes an excellent exfoliator! Gently massage problem areas and anywhere else to reveal soft, radiant skin. 3. EASY GRIP IN OR OUT OF THE SHOWER – POVAD fits so perfectly in the palm of your hand that you may think it was custom made just for you. Simple and comfortable to hold no matter where you need ingrown hair relief, even if your hands are lathered with shaving cream or oil. 4.PERFECT FOR ALL SKIN TYPES – No matter your skin type, POVAD’s flexible brush fibers provide a perfect solution for preventing pesky, painful bumps. Most ingrown hair treatment options are too harsh for sensitive skin, particularly for delicate areas where ingrown hairs and razor bumps tend to form. 5.100% MONEY BACK GUARANTEE – We can’t wait for you to feel more confident and comfortable in your own skin now that you won’t have to worry about unsightly red bumps all the time. But, if for whatever reason you feel like POVAD isn’t for you, that’s ok. Every purchase comes with our 100% money back guarantee. Don’t just eliminate ingrown hairs and razor bumps, prevent them! 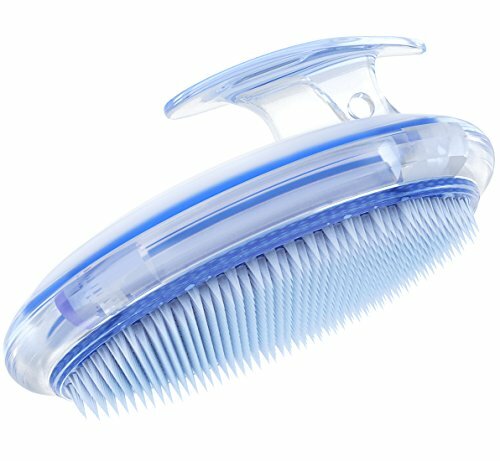 1.The exfoliating brush to treat brush is made of high quality PVC soft glue, which is harmless and harmless. It protects your delicate skin. 2.Suitable for all skin types, no matter your skin type, Dollshouse¡¯s flexible brush fibers provide a perfect solution for preventing pesky, painful bumps. 3.Oval shape and hand clip handle for easy massage control. 4.This silky smooth skin brush can rub and wash your hair during shampoo and bathing. 5.The hair brush can be thoroughly released, effectively cleaning the bottom of the scalp, thoroughly cleaning the dirt, such as hair spray, sweat stain, dandruff, etc. 1. 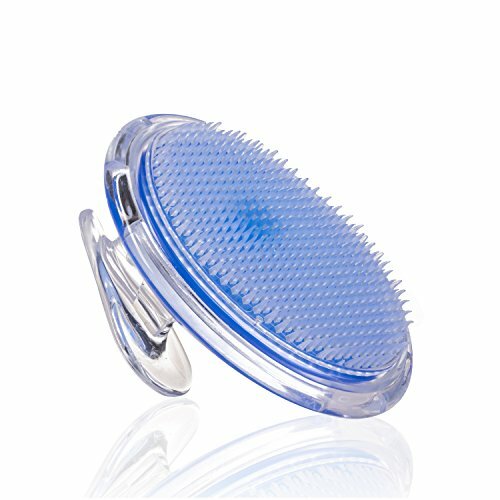 This exfoliating brush is a scalp massager for hair care. It is specially designed for shampoo and bathing. Do not use it as it is. 2. 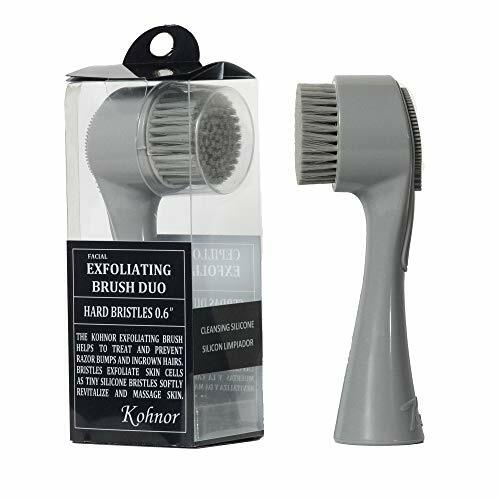 This exfoliating brush is suitable for 5-10 minutes and should not be used for a long time. 3. This smooth skin brush is suitable for family members, but it does not include children and children. They should be kept away from children. 4. 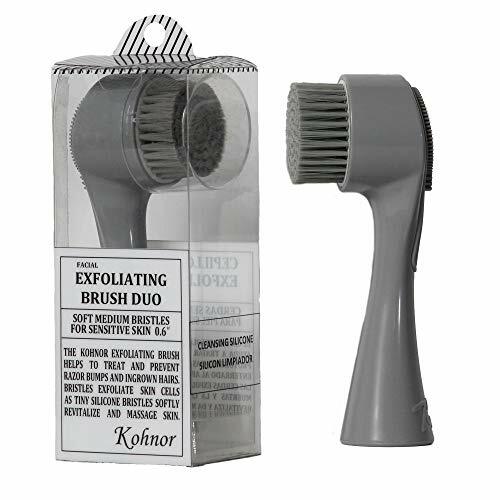 This face exfoliator brush should be kept away from high temperature and away from fire source. Please store it in dry and ventilated place. 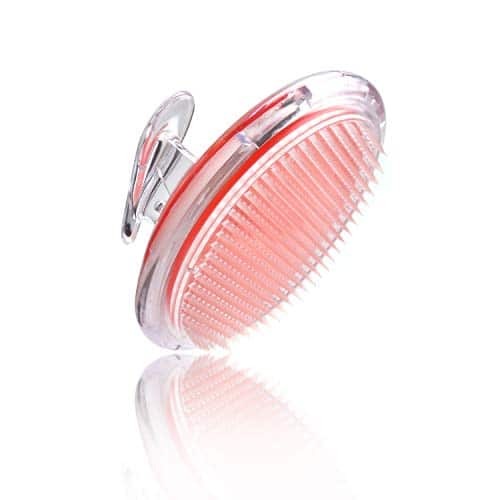 SAFE MATERRIAL: The face exfoliator brush is made of high quality PVC soft glue, which is harmless and harmless. It protects your delicate skin. There are numerous brushes on the PVC soft rubber chassis, which can not only effectively massage hair scalp, but also comb your hair. NICE DESIGN : Our bristle brush is ergonomically designed. It was a sturdy handle which fits your fingers for increasing the grip force although it wet. When use the massager brush in your hand, you can apply the perfect pressure to use on any part of your body you can reach. 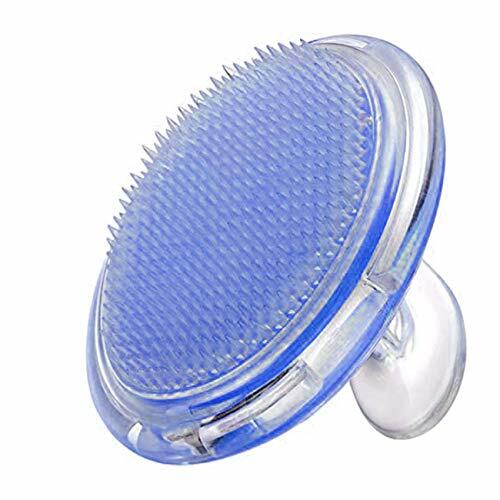 HIGHEST QUALITY: This smooth skin brush can effectively massage all parts of the scalp in the hair and stimulate all the acupoints on the head. 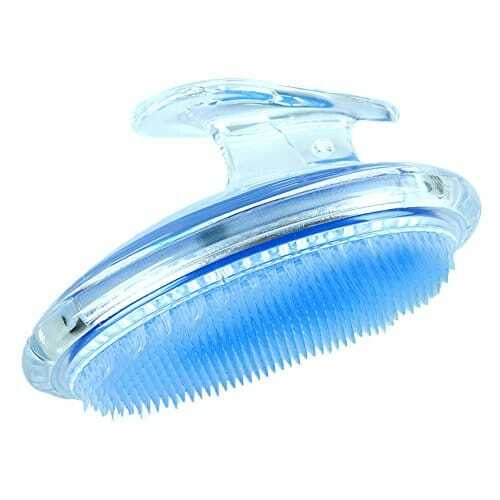 Gently close your eyes, this product brush body massage tentacle point in the head of no stop sliding, give a person super comfortable, numb feeling, instant from the head to the body, the whole body can not say comfortable and relaxed. 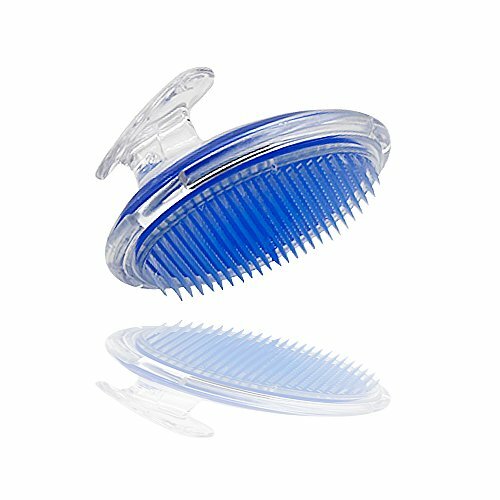 WIDE RANGE of APPLICATIONS: Eliminate shaving irritation for face brush for hair care Scalp Massager, designed for shampoo, bath, every shampoo and shower, you feel fresh and refreshing. SUITABLE FOR ALL SKIN TYPES: Most ingrown hair treatment options are too harsh for sensitive skin, particularly for delicate areas where ingrown hairs and razor bumps tend to form. No matter your skin type, Dollshouse¡¯s flexible brush fibers provide a perfect solution for preventing pesky, painful bumps. One of the best most desired gifts for Women! SanDine’s Ingrown Hair Brush makes the perfect holiday present for mom. 4. For best results make this part of your shaving routine and do it before each shave or wax. We recommend using your Sandine Brush before shaving. Thus, you will clean and open the pores resulting in much closer and smother shave and preventing new ingrown hair generation. Shaving can exfoliate the Skin hence using your brush immediately after shaving or waxing can cause irritation, redness, and itchy skin. That is why the best practice is to use your razor bump brush before shaving or waxing. Take out the inside support. You are now ready to clean it. ✔ VERSATILE AND MULTIFUNCTIONAL – Our brush will become your favorite exfoliating tool with its many different applications and possible uses by both genders. It can reduce the razor bumps on your beard or take care of the annoying ingrowns on your legs, armpits or bikini area. You can even use it for shower massage or as a shampoo brush. ✔ FEEL THE SILKY SKIN FROM YOUR DREAMS – Finally a tool that will significantly reduce shaving irritation, razor bumps and ingrown hairs appearing on your legs or bikini area. Whether you shave or wax, It Really Works and will help you show off with confidence at the beach this summer. ✔ SIMPLE AND EFFECTIVE SOLUTION FOR IGROWN BEARD HAIRS – Most of our clients report huge difference within two weeks of use. Just make sure to prep your face with warm water, use the right amount of pressure for your skin and brush the bumps away with circular motions. ✔ HYGIENIC SAFE AND ERGONOMIC – Made of high quality hypoallergenic materials your silky skin brush is safe for the skin. With ergonomic handle design, it fits perfectly in your hand and it makes it easy to glide even when it is wet and slippery – we have even added a wrist strap for improved handling. NO MORE SOAPY MOLD trapped inside your body brush. It is now easy to disassemble and clean it in seconds. For A Silky Smooth & Ultra Soft Skin… Pureauty Naturals Charcoal Blackhead Mask Is The Way To Go! … beauty products being harsh on your skin. … struggling with acne and a face full of blackheads. … treatments that leave your skin all dry and dull. We have the answer to all your problems. A Pureauty Naturals charcoal peel off mask. 100% made in the USA. Try it today and experience the difference on your skin from the very first use. Apply this peel off mask on your pretty face, wait for less than half an hour and cherish the stunning results on the spot. What Makes This Charcoal Peel Off Mask Stand Out From The Others? Yeah we know… With a quick scroll through the Instagram or YouTube, you’ll find endless beauty gurus using a weird looking black peel off mask. You want one too, right? Don’t just get an ordinary charcoal mask. Get the finest blackhead mask on the market. A Pureauty Naturals charcoal mask of course. Packed with the highest quality activated charcoal, antioxidant vitamins, plant extracts and MFA (multi fruit acids), this peel off mask is here to satisfy even your most demanding needs. Among the many extracts you will find acai extracts, green and white tea, apple, sugarcane, and more! Irresistible Skin Benefits That Make This Peel Off Mask An Absolute Must Have Addition To Your Skincare Regime. Use this charcoal peel off mask, to purify, detox and cleanse your skin, draw out impurities, soften and glorify your complexion, achieve an even skin tone, eradicate pores and blackheads, and restore natural pH levels. RESTORE YOUR SKIN’S YOUTHFUL GLOW: Enjoy a smooth, soft and bright skin without having to spend a small fortune on pricey doctor’s appointments. With a Pureauty Naturals charcoal peel off mask by your side. Draw out impurities from your skin, eliminate dead cells, remove dulling and boost natural youthful skin glow! ELIMINATE STRAWBERRY LIKE NOSES: Forget about noses full of pores and blackheads. Forget about all the embarrassment. Forget about painful pore remover treatments. Kiss blackheads and pores goodbye with this powerful charcoal peel off mask. Cleanse and purify your skin, minimize and tighten pores, and reduce blackheads. SPA RESULTS IN THE COMFORT OF YOUR HOME: Save your hard earned money and precious time today by simply investing in this charcoal peel off mask. Get spa like results in the comfort of your bathroom. Just clean your face prior to use, apply a generous amount evenly, wait for up to 30 minutes, then gently peel off and enjoy! MADE IN THE USA – ENRICHED WITH THE BEST: Do not settle with anything less than perfection when picking your beauty and skincare products. Our charcoal mask is proudly made in the USA and is 100% safe. Besides the powerful Charcoal, this peel off mask is fortified with multi fruit acids, acai extracts, green tea, plant extracts and more. GET THIS CHARCOAL PEEL OFF MASK RISK FREE: Since your satisfaction is our top priority, this blackhead remover and pore minimizer peel off mask is backed by our 90 day money back guarantee policy! Just in case you don’t simply love it. It comes in a generous 2 Oz (59ml) bottle, for hassle free carrying! Beautify your skin even on the go. Don¡¯t just eliminate ingrown hairs and razor bumps, prevent them! Whether you¡¯re getting ready for a big date, important meeting, or a day at the beach, the last things you want to have to worry about are razor bumps and ingrown hairs. And with Aneky, you won¡¯t have to! Our innovative brush features flexible fibers packed at the optimal density to banish those pesky red bumps for good. Razor bumps appear when the hair curls back into the skin, whereas ingrown hairs happen when the hair gets trapped beneath the skin. In both cases, massaging Aneky over problem areas will help to release and remove trapped hair for visibly smoother skin. Plus, fun fact: dry brushing is also known to stimulate lymphatic drainage and reduce cellulite. Some exfoliation products can be damaging to sensitive and delicate skin. With Aneky you have control of how intensely you want to exfoliate. Whether using on the beard, bikini area, or anywhere else, simply apply more or less pressure until you find what works best for you and your skin. In or out of the shower, you¡¯ll enjoy a secure hold with Aneky¡¯s unique, ergonomic design. Made to be easy to grip, even with soapy, sudsy hands. And don¡¯t worry about anything getting trapped in your brush. Your Dylonic can be disassembled to drain water, soap, or anything else that may have collected in the head. This means it will stay safe and hypoallergenic through months of use. SAFE MATERRIAL – Made of high quality PVC and PS plastics which is non-toxic and take care of your tender skin. EASY-TO-HOLD, ERGONOMIC GRIP ¨C Wet or dry, Aneky fits so perfectly in the palm of your hand that you may think it was custom made just for you. Simple and comfortable to hold no matter where you need ingrown hair relief, even if your hands are lathered with shaving cream or oil. DIFFERENT WAYS TO USE – Use before and between shaving, waxing, and electrolysis as directed along with proper skin care and hair removal methods.